A decadent, 3-layer chocolate cake surrounded with the most luxurious, rich chocolate frosting. This week was very emotional for me as a mother. My baby turned one, my toddler started school, and it was my last week of maternity leave as I’m back to work on Monday. As I reflect back on the last 12 months, I have to say it’s been quite interesting. My transition from being a mother of one child, to being a mother of 2 children, was difficult. Maybe it’s because I thought it would be easier the second time around. I mean, I’ve raised a baby before and I was having another boy, should be the same experience right? Nope, not at all. I ended up with a completely different baby I was not prepared for. My first son would only cry when he wasn’t feeling well, my second was colicky. My first would smile back at anyone who smiled at him, my second would stare at new people with a serious look or cry, which would scare them away. My first started sleeping through the night on his own at 4 months, my second still is waking up multiple times at night. So, I haven’t slept well in over a year, which equals grumpy mommy. Both my boys love chocolate, they get that from my husband and I. So, that’s why I decided to make the chocolate truffle cake from the cover of Martha Stewart’s Cakes cookbook. I have to warn you, this cake is for chocoholics only. 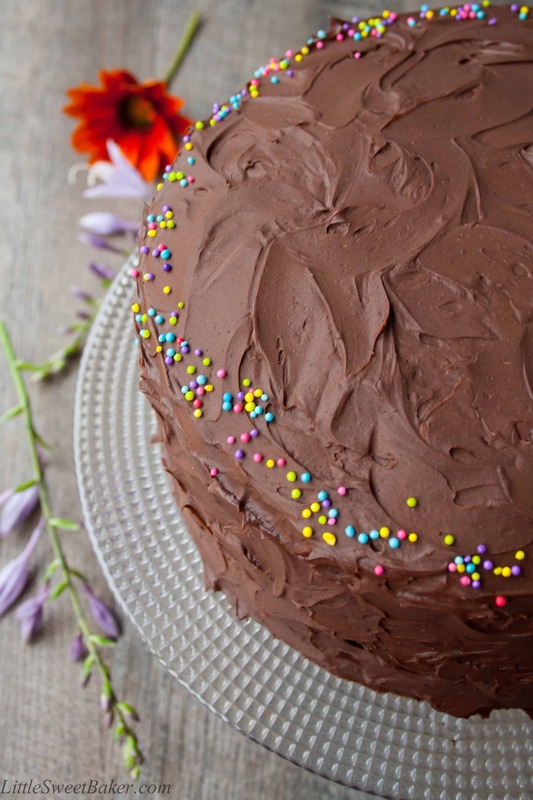 It has layers upon layers of chocolate cake surrounded by a deep, rich chocolate frosting. 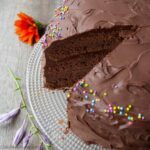 I used 1 & 1/2 pounds of chocolate and over a cup of dark cocoa for this cake, so it’s not for the faint of heart, but it is for chocolate lovers. Preheat oven to 350°F. Butter and line three 9″ round cake pans. Sift cocoa into a medium bowl. Stir in the boiling water and half of the milk, gently whisk until smooth and add remaining milk. Set aside to cool. In another bowl, whisk together cake flour, baking soda and salt, set aside. 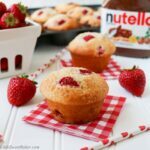 Using an electric mixer, beat butter for 3-5 minutes until light and fluffy, gradually beat in sugar and vanilla. Then mix in eggs, one third at a time. With the mixer on low, add the flour and cocoa mixture a little at a time in alternating batches, starting and ending with the flour. Beat until just combined. Divide batter among the 3 prepared pans, smooth tops with an offset spatula and bake for about 20 minutes or until a toothpick inserted into the centre comes out clean. Be careful not to over bake. Sit pans on wire racks to cool for 15 minutes, then turn out cakes onto the wire racks to cool completely. 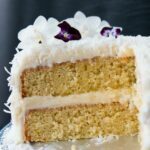 Trim tops of cake layers to level before frosting. In a small bowl, whisk together the cocoa powder and warm water until all of the cocoa is dissolved.Using an electric mixer, beat butter, sugar and salt until pale and fluffy. Slowly beat in melted chocolate and then cocoa solution until smooth and what you’ll get is a lovely dark, glossy and rich chocolate frosting. It will be hard not to put your face in the bowl. Spread about 1/3 of frosting between each layer and spread the remainder of the frosting on top and sides of cake. I had made my cake the day before and refrigerated it overnight, so the frosting had hardened and lightened up as you can see in the initial pictures. 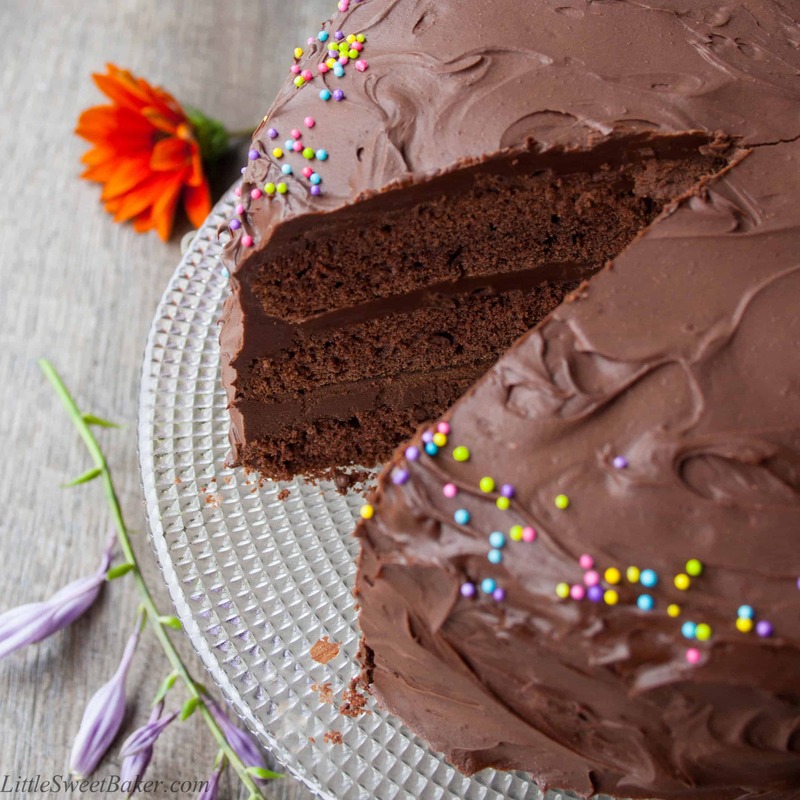 I took the cake out just before my guests started to arrive and by the time the it was ready to be served after dinner, the frosting softened back to its original dark and glossy form. I baked this for my son’s birthday party and he loved it so much that he could not stop asking for more! 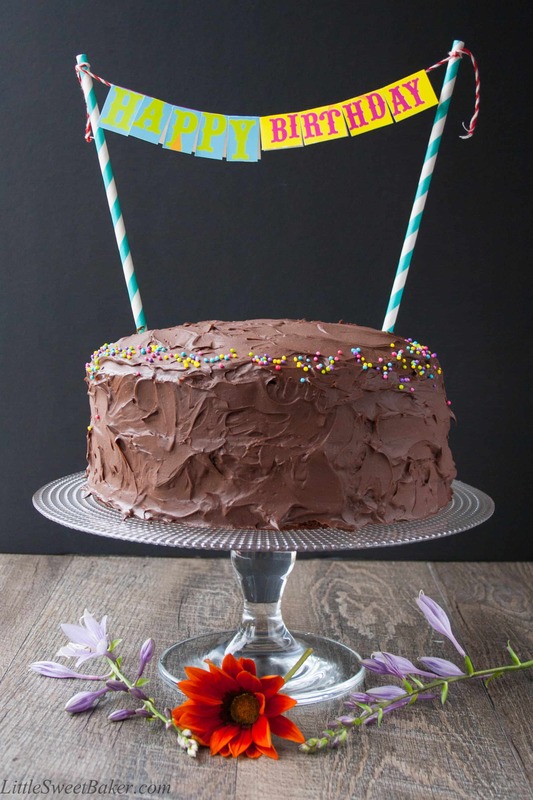 You can use this recipe to make an 8″ cake. Just don’t over fill your pans, so you might have some batter left over. Enjoy the cake and have a lovely day! Tried your chocolate chip muffin recipe and it was such a super-duper success that now I feel brave enough to try this birthday cake. Just one problem: I can’t find unsweetened cocoa powder anywhere. 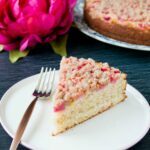 If I use the sweetened version, how do I adjust the sugar amount in the cake as well as the buttercream? Please guide. I love the perfect amount of color that the sprinkles add. So cute!